Happy Fourth of July, my friends! I hope you are enjoying a day full of all things Americana–I know I’ll be relishing our sweet freedom all day, munching on chocolate chip cookies and savoring vanilla ice cream with red, white, and blue sprinkles. Throw in some patriotic songs and you have yourself a gloriously patriotic day. I’m here today to advocate for my favorite pavilion in all of Epcot. The American pavilion, home to a completely underrated show and the most beautiful entertainment in all of Walt Disney World, is a real gem and a tribute to the American people and the adventurous, innovative, and diligent spirit of this great country. I never leave the American pavilion without feeling inspired to do my part in propelling America forward into the future–the message of this entire pavilion is one of hope and pride, and I honestly can’t get enough. There are three main activities to do at the American pavilion. First: The American Adventure is a wonderful thirty-minute show detailing events in America’s history that makes America uniquely…American. I love this show so, so much. It’s narrated by Mark Twain and Benjamin Franklin, and it’s delightfully Disney-fied. Expect charming animatronics, moving video clips and montages, and an inspiring soundtrack. Goodness. I get chills just thinking about it. The shows run all day, and it’s a wonderful way to take a break from the stifling Florida heat. We skipped this show on our first trip (ignorance and first-time energy and excitement can do that to you), but now it’s an Epcot must-do. So. good. The second (and my favorite) activity to do at this pavilion? Listening to the marvelous musical workings of the Voices of Liberty. THE VOICES OF LIBERTY MIGHT BE MY VERY FAVORITE THING IN ALL OF EPCOT. YES, ALL CAPS IS COMPLETELY NECESSARY IN THIS DECLARATION OF MY LOVE. The Voices of Liberty perform before almost every show of The American Adventure, but check your times guide or with a cast member to receive an exact show schedule. There is also usually a board with times listed outside of the attraction. THIS IS A MUST-DO. I REPEAT. THIS IS A MUST-DO. Make time to do this. Please. I love it so much. They perform under the “dome” of The American Adventure’s beautiful building (see picture of building below…it’s hard to miss), and guests are invited to sit on the floor under the dome to experience their voices to the fullest. They are an acapella group that sings Americana, folk, and other songs, and I just love them with all of my heart. They are also known to sing a few classic Disney tunes, but literally every show is different. The last time I watched the show, they sang a “flag” medley, the state song of Tennessee, an old cowboy love song, and “America The Beautiful.” I’ve seen many shows, and no show is exactly the same. Please see this. Camp out and see it. Take a break from the heat, and be prepared to be moved to tears. I often am, and it’s embarrassing but totally viable. The group is so incredibly talented, and the combination of incredible singing and patriotism can do something to you. Again, ask a cast member or pick up a times guide so you don’t miss this incredible Disney gem. The last thing to see at this pavilion? The building itself has so many things to look at–art, quotes from famous American leaders (including the guy that drew that mouse that one time), and an entire special exhibit. The current exhibit discusses the struggles and the triumphs of African Americans, and it’s so cool. My usual routine involves experiencing the exhibit, watching the Voices of Liberty, and finishing with a showing of The American Adventure. It’s about an hour’s worth of sweet, sweet air conditioning. I hope you take the time to experience this pavilion the next time you are exploring Epcot. It’s seriously my favorite–I didn’t even mention the food, and it’s delicious, too–and it deserves your attention and appreciation. I might be biased. I do love America a whole lot. 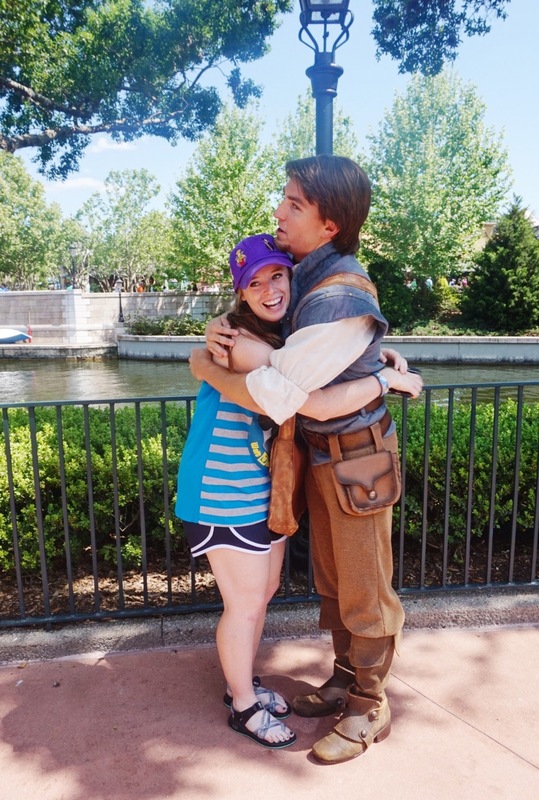 Let’s talk Disney couples, because what else do you talk about on Valentine’s Day?! 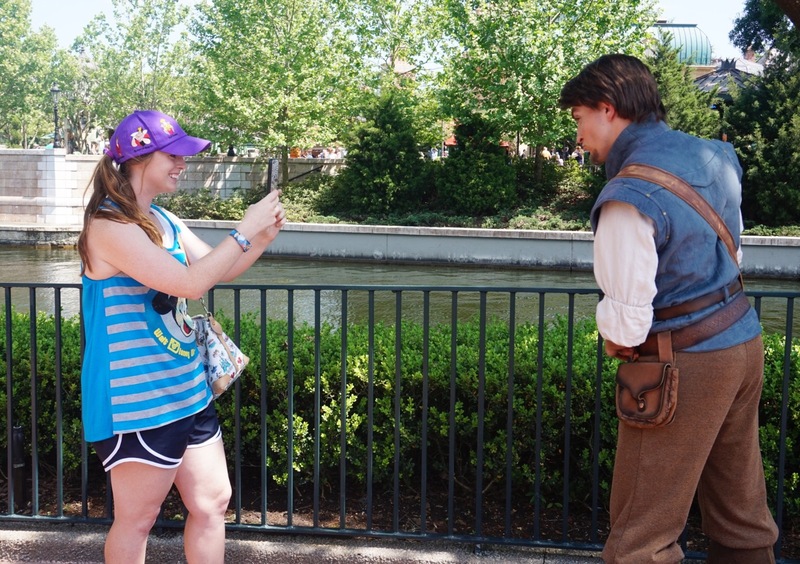 EUGENE FITZHERBERT. Who doesn’t love the most attractive animated character in the history of animated characters? 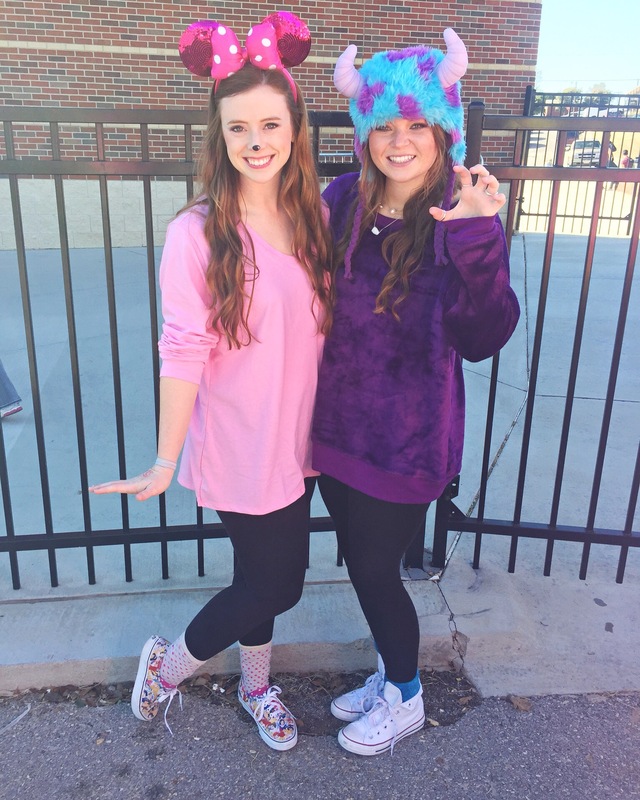 I also love Rapunzel–she’s a dreamer, spunky, independent, and takes charge. Separately, the two are fantastic. Together, Rapunzel and Flynn rule the world. Recording the “Smolder” so it could live forever on my sister’s phone. This. Is not. A DRILL! Rapunzel doesn’t necessarily change Flynn and Flynn doesn’t really change Rapunzel. He still has his sense of humor at the end of Tangled, and she is as spunky as ever. They just…go together. I hate saying the words “complete each other,” because a person is never not whole, you know? They just bring out the best in each other. They help each other find “new dreams,” and when a person helps you find and achieve whatever your dream may be, I believe that person could be a keeper. They are so wonderful together. They have the same thing going for them as Flynn and Rapunzel–they don’t necessarily complete each other, they just go together like beignets and powdered sugar and honey. Naveen hasn’t worked a day in his life, and Tiana works too darn much. They balance each other’s personalities and together they live a happy, “swingin’ good time” life. That quote is from Mickey’s Royal Friendship Faire, a show on Disney property that showcases just how wonderful Tiana and Naveen are. Much love, Tiana and Naveen. Much love. 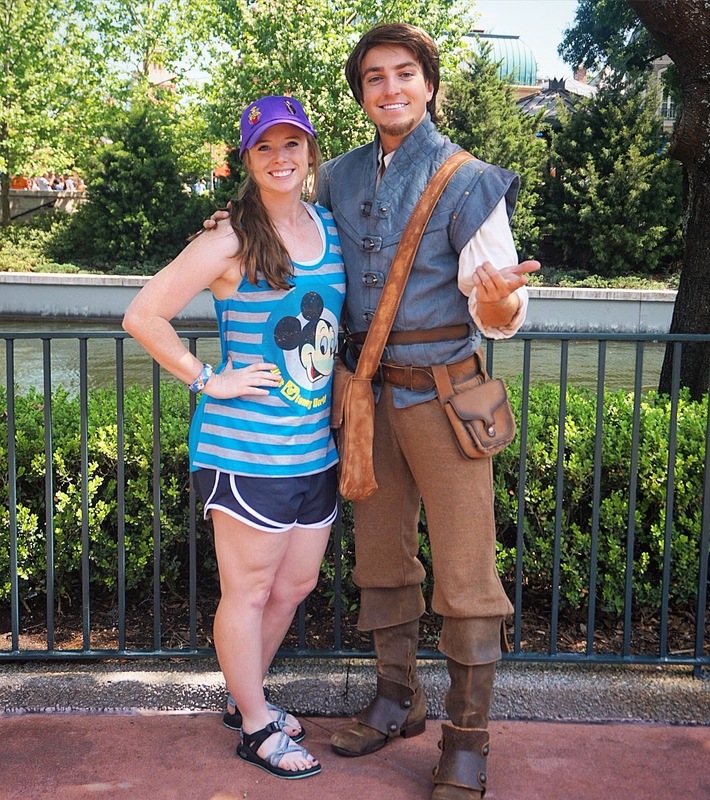 This one is for my sister: she claims she and her boyfriend are exactly like Anna and Kristoff. I could see it. We can all agree that Valentine’s Day isn’t just about romantic love, but it certainly is fun to talk about our favorite Disney couples. Who are your favorites? Comment below or join the conversation on Instagram. I hope you all had a lovely Valentine’s Day! Happy #SinisterSunday dahlings. Remember, every month of October is dedicated to a Disney villain, and this week goes to that fur-wearing task master. Ah. Cruella de Vil–yes, this Disney villain is pure evil, but no one can deny that she is absolutely fabulous. She’s a snappy dresser, applies her makeup with an impeccable heavy hand, and knows how to rock a statement piece. Sure she’s evil. But Cruella knows how to own it. When I met Cruella at Club Villain earlier this May, I asked her how we should pose for our portrait. She replied, “I always like to take up as much space as I can, dahling!” and proceeded to thrust her hands into the air and point her stiletto in the direction of the camera. I attempted to take up as much space as the queen of color-block, but there is just something about Cruella’s presence that can not be duplicated. There’s something to learn from Cruella’s attitude. I’m a believer in taking up as much space as you possibly can–figuratively, of course. Don’t be afraid to put yourself out there, to wear your most fabulous dress to the most mundane occasion, to splurge on that bag that you have been eyeing. Have confidence in yourself and your abilities. You can do so much; know it and show it with as much vim and vigor as you can. Show up, own it, and strut your stuff. Just embrace every inch of your life. Take up space and love it. .
Just be sure not to skin any puppies while you’re at it, ok? Faux fur can be fabulous, too. It’s finally October, the month of cool breezes, pumpkins, and spooks. To celebrate, I have decided to showcase a Disney villain every Sunday of October. Welcome to #SinisterSunday, my friends. 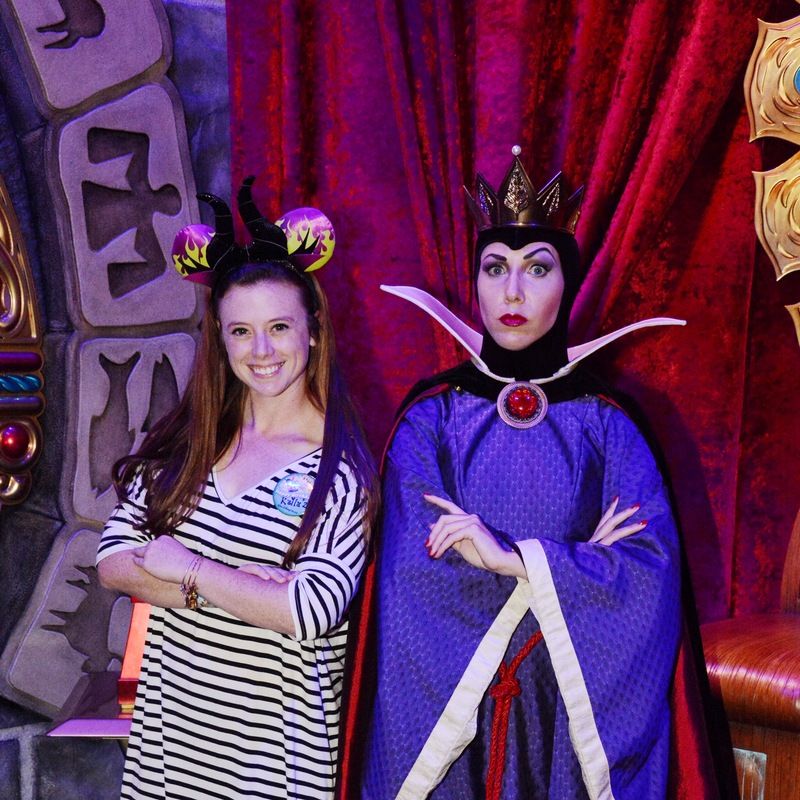 First up: the Evil Queen from Snow White and the Seven Dwarves. Ah, the Evil Queen. Her vanity consumed her and became her demise, she could whip up a peculiar apple pie in no time, and she has impeccable style. What? Purple and red pair marvelously together. Let’s digress and talk about the Evil Queen in her newest manifestation: Regina Mills from ABC’s Once Upon a Time. I love Regina. (“Queen” in Latin. Pretty cool huh?) At the beginning of the show, Regina was as evil as evil gets–full of hatred and vengeance, casting wicked curses left and right. She was unapologetically awful. Her frankness, although wicked and horrible and frightening, was something to (sort of) be admired. What makes Regina truly wonderful, however, is her ability to overcome her evil tendencies and her dysfunctional family. She eventually chooses to be good, to find her own happiness. Once Upon a Time is just so good. Bottom line: Once Upon a Time asserts that we can choose to overcome our genetic tendencies and work toward our own happy ending. Regina’s growth throughout the series reminds us of this. The Evil Queen decided to overcome her title and become not so evil after all. That’s all for this installment of #SinisterSunday. I hope you are having a wickedly wonderful first week of October, my friends. Just be careful to avoid suspicious apples, okay? I know. It’s crazy. I actually have something other than Disney and the college program on my mind. And that something is the glorious Olympic games being held in Rio. I have always been a sucker for the games. I’ve read Michael Phelps’ books multiple times. I used to (and still do) stay up for all of the prime time coverage and the extras, including those special little news features about athletes who overcame adversity through insane courage and persistence. I even have the Olympic theme music on my phone; I bought it in the eighth grade and have never looked back or regretted the impulse buy. I think my obsession might be in-sync with the country, and, perhaps, the world. Every time an Olympics rolls around, the world watches with fervent passion and consistency. We become fiercely patriotic, even if it is just for a couple of weeks. We become invested in all of the athletes’ backstories. We buy magazines with athletes on the cover and a little section devoted to the Olympian-tested workout. We Tweet about the Olympics, post lengthy Facebook statuses about the Olympics, and Instagram about the Olympics. Why do we love the Olympics so darn much? I can tell you why: even if you do not realize it, we love the Olympics because it showcases human spirit and tenacity. Athletes finally get their reward after years and years of hard work and sacrifice. Even if athletes do not win a medal, it is amazing to think that they are able to represent their country in a positive light. We see ourselves in the Olympians–we crave reward, we know about sacrifice in different aspects of our lives, and we want to represent our country and our families in a positive way. The Olympics showcase classic stories of success through hard work; to see the happiness and realization of a dream coming true is addictive. We keep coming back for more and more. I was absolutely loving watching the women’s gymnastics team clinch gold the other night–their happiness was infectious, and I found myself smiling from ear to ear. They were young women causally achieving their childhood dreams of gold. We were a nation casually united for one purpose–to encourage and to praise the “Final Five,” the golden girls. That’s another thing I love about the Olympics: for two weeks every four years, our country becomes just a little more cohesive, united. Our world becomes a little more united as well; sometimes I just choose to root for an athlete because of their story or the way they carry themselves. You recognize that athletes, no matter what country they are competing for, are just athletes. I don’t know why I started writing this in the first place, but I think I’ve come to some conclusion–the Olympics bring out the best in a lot of people. Athletes, citizens of the world, and dreamers everywhere. Thanks for existing every four years, Olympics. You used to fuel my competitive fire, and now you fuel my human spirit. Every new year brings a chance for a fresh start, but 2016 certainly feels like the freshest fresh start I’ll ever receive. First of all, I’m participating in the Disney College Program. New state, new town, new state-of-being. I’m not a student anymore, I’m a…somebody. Not quite adult, not quite a kid. I’m a twenty-something. A person who has no idea what her life will look like in six months. A young woman who doesn’t quite know what her next five years will look like. 2016 will be my first year in a long time where I won’t be participating in an organized sport. I’m not thinking about a conference championship anymore (we won one of those, by the way). I’m thinking about salaries and jobs and opportunities and my future and what not. 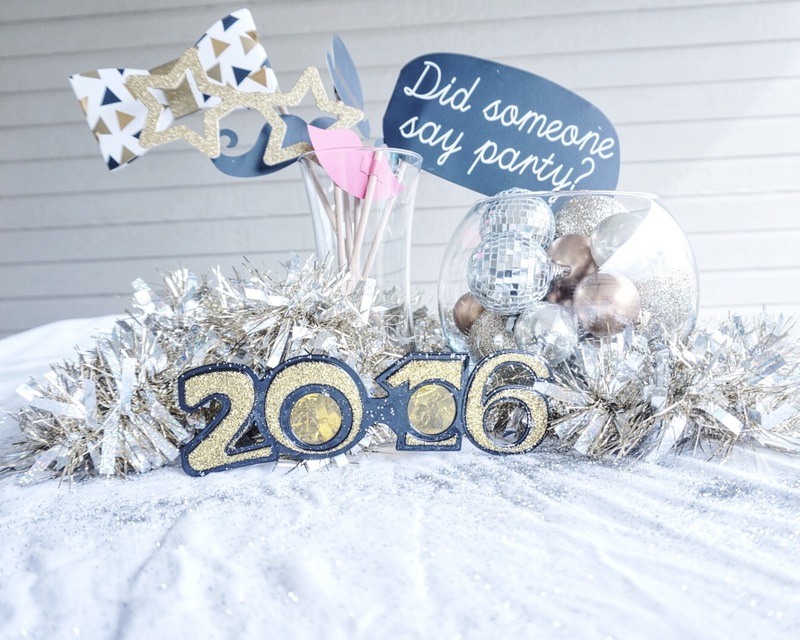 2016 is chock-full of new beginnings. Here are some of my resolutions for the new year, in order to fully take advantage of all my sweet fresh starts. Write a blog post at least once a week. Hopefully I can do that for myself and for my readers (thank you all!) in the blogosphere. Keep up with my physical fitness. Do something–something–everyday that benefits my health. Even if it just means meeting my 10,000 steps goal walking around the Disney parks. RELAX AND ENJOY EVERY MOMENT. I’m moving to Disney for six months, maybe for even longer (and maybe not). I want to take in as many sights, smells, attractions, characters, and magical moments that I can. Explore and take in new experiences. I want to visit St. Augustine, Cape Canaveral, GatorLand, Harry Potter World, and so much more during my time in Orlando. Document my journey in my journal my mom gave me. I want to remember this exciting time of my life. Here’s to a new year, my friends. Let’s take in every moment of every second and try to savor the way we feel at this point in our lives. I’m young, I’m moving to Disney, and I have the whole world at my feet. 2016 will be a year to remember and cherish; I can just feel it. I hope everyone is having a splendid holiday. So far I’ve attended a football game in costume and my sister and I are planning to go trick or treating in a little while. And yes, I am 22 years old. Other activities will include watching “not so scary” Halloween movies with one of my good friends. It’s shaping up to be a frightfully fun Halloween. 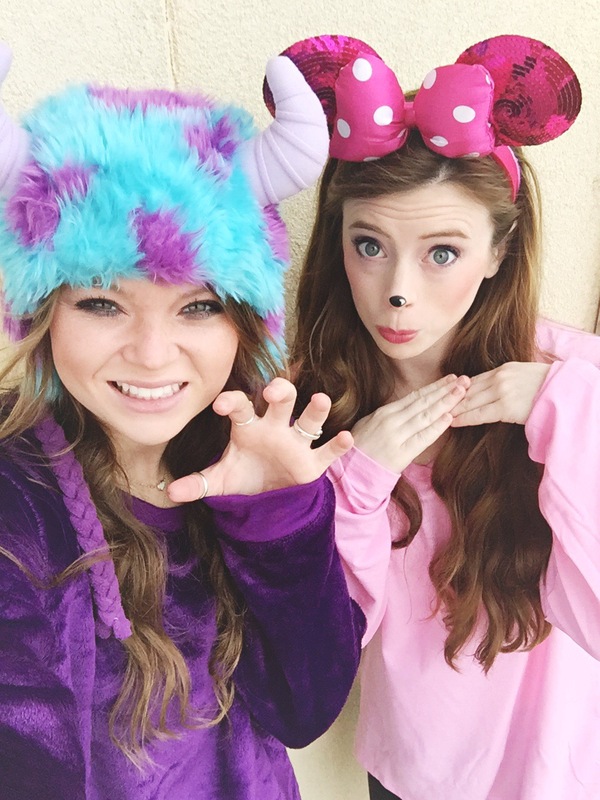 Enjoy some pictures of my sister and me in our Disney-fied costumes. 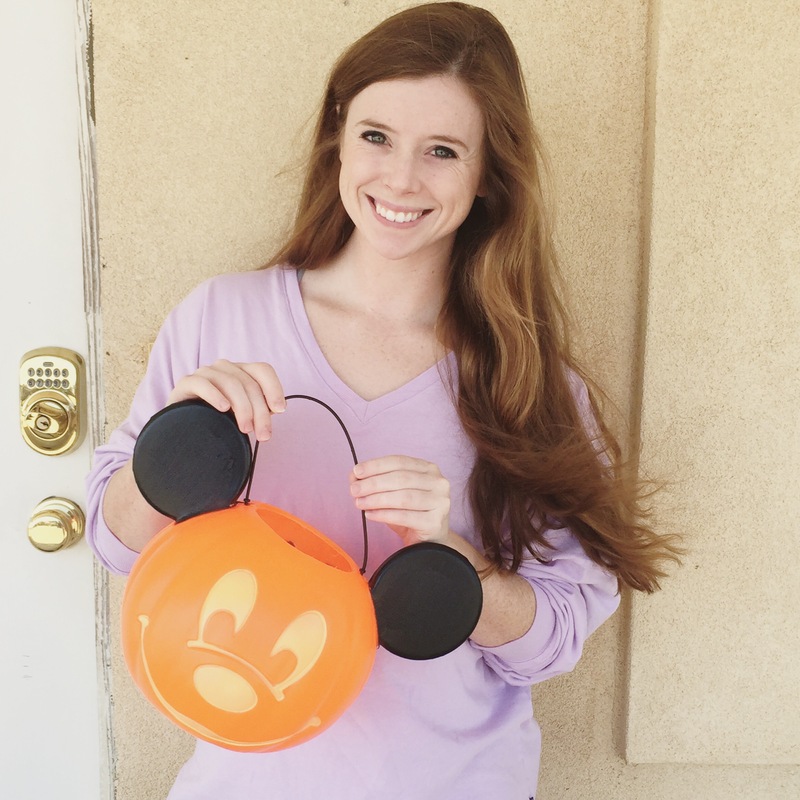 Was there any other choice of costume for a future Walt Disney World castmember? I think not. Minnie is such a classic (and I had the ears) so it was a no-brainer! I hope everyone has a wickedly wonderful Halloween! It’s Beginning to Look a Lot Like…Halloween! Just wanted to share this gem I found at Walgreens! It definitely put me in a festive mood!